And there are lights, as you can see - pulsing/blinking in the warp nacelles, blinking position lights at the top of the P.
Since Flickr has problems today, I uploaded all 40 photos here to my blog (where you can also click to zoom and browse through them - no per-picture comments, though). 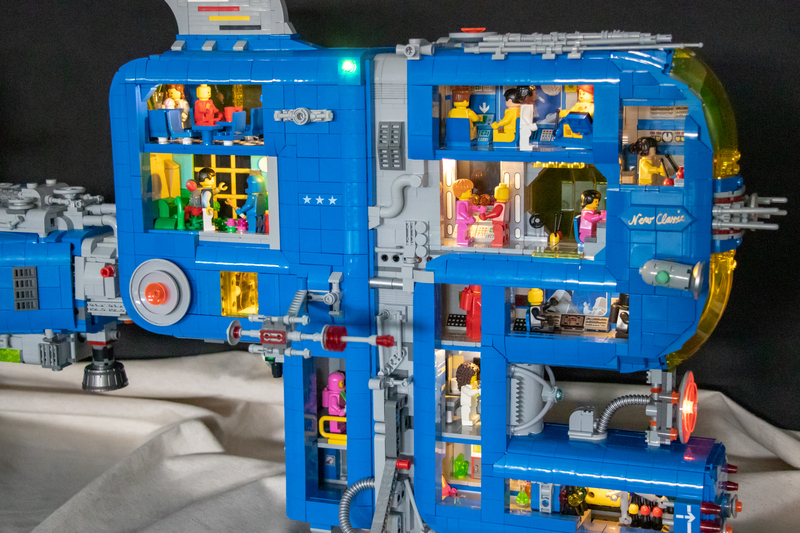 I know this seems trivial in light of the novel ingenuity of this build in its entirety, but my favorite detail has to be that retro-styled fin atop the "P" in SPACE! 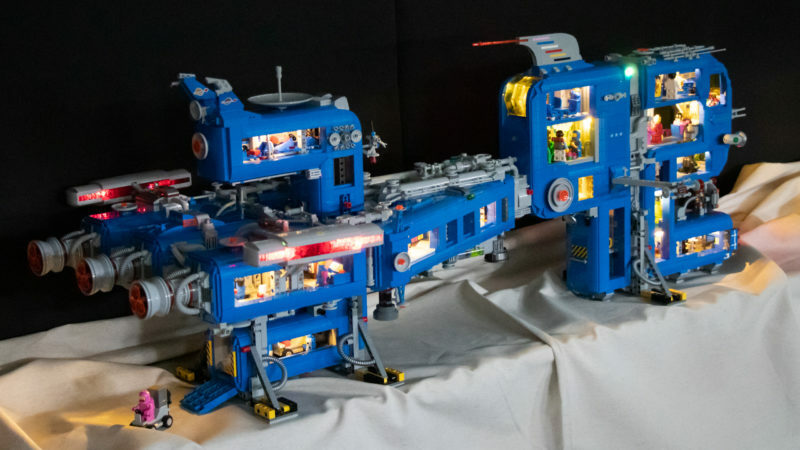 This is the most impressive MOC I've seen in a long time in terms of both creativity and execution. Do you know an approximate piece count? Fantastic. My favourite detail is the encounter with the little green alien. Also, well done on spelling 'space' correctly. 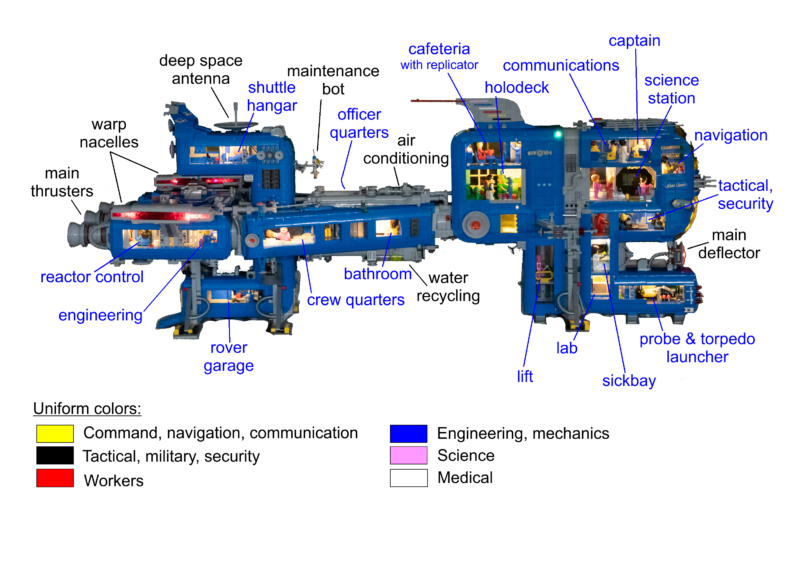 Very easy to lose track of the spelling on such a large scale, and end up writing SPAE or SPCE! This is brilliant! I love how the shape feels natural as a spaceship, yet also easy to recognize as the letters of the word SPACE! I also love how well you managed to balance curved shapes and straight lines in order to create something that looks refined and modern, yet also maintains that nostalgic 80s design language. Bonus points for the fin with stripes in the classic Space uniform colors! A lot of builders who make Classic Space throwback MOCs refrain from flourishes like that which aren't based in the original Classic Space color scheme, but you made it work really well! The full interior is also a delight and really shows how well your experience building houses translates to a sci-fi context. 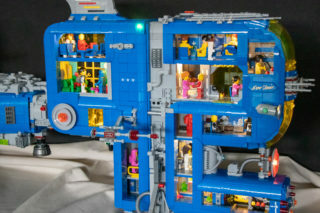 I can't think of many spaceship MOCs that were as thorough about making the interior feel fully livable, even at a scale like this. 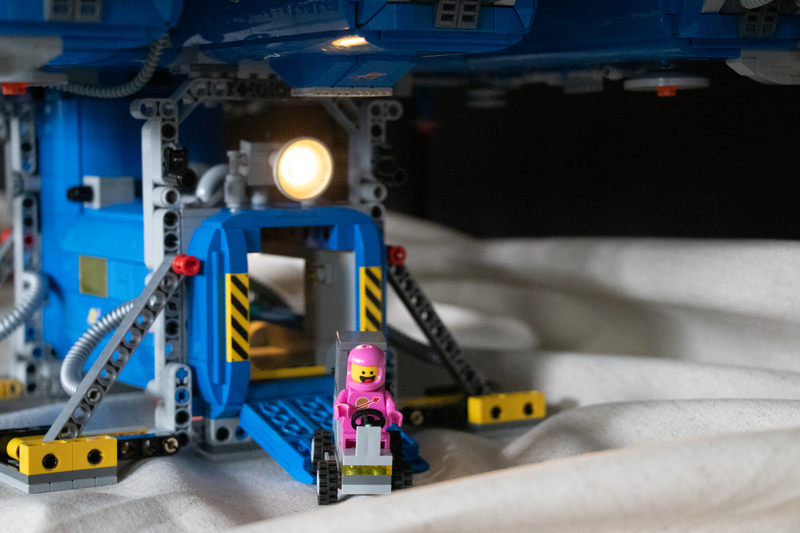 Really an outstanding MOC in every possible way! This is brilliant. Very creative, modern and retro looks mixed to perfection, congrats on the great job! Wow - so creative in inspiration and execution. Approximately how long is it? The curves of the canopies and the hull around the S give it such an old-school look, as if you might have seen this floating around zemi.net 12 or 13 years ago. What an amazing build. Thanks for sharing. It's about 111cm long (including antennas), 46cm wide and 40cm tall. Great idea to make a spaceship with the letters. For some reason it looks a bit 'oldskool', maybe becauase of the colors and that panel with the planet. I think I regonize it from old sets from the '80's? Like the grey too between the letters. One color looks good but this is more cooler I think. A Flickr album is available now, too. This is awesome in so many ways! A clever idea, brilliantly executed. This is so beautiful !!!! ...very original idea and amazing design ...I like the moder shape and the classic space colours! This is an incredibly gorgeous build. Full props. It's spectacular! I hope you do more like this. A seriously huge investment in parts there. Those supports on the bottom, can they angle up on the hull? In other words, are they literally landing legs? Yes, with the red pin fitting in the protruding hole on the small L-liftarm. Which also saves space when I'll put the modules in a box for transport. And yes, it's modular: SP, A with 8 studs of the C, top and bottom of the C, and the E are the modules. Wow! 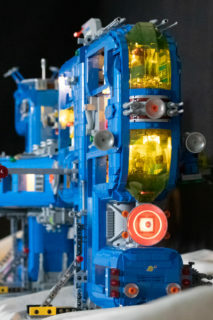 I looked through the high res images and I see technic beams for the frame. A very well constructed space ship/cruiser. 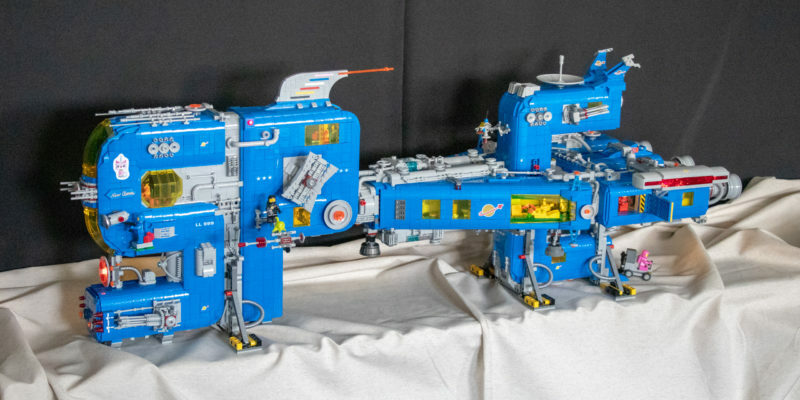 Reminds me of the original lego space ships with your colours. 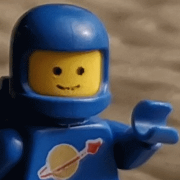 You have just taken lego space to another level. Wooh! You have really done a great job on the shape and interior. That is an impressive build. Thanks for sharing.